Yes, you read that correctly, it does say pumpkin tiramisu. I didn’t want to let pumpkin season pass by without at least attempting to create and like a couple more recipes. I won’t say that I love it yet, but it’s becoming more tolerable. I really wanted to buy a real pumpkin and not purée in a tin, and cook with it. Honestly though, none of the pumpkin recipes on the internet appeal to me. All the cakes, scones, bars, cupcakes and pies, as lovely as they look, they’re not what I want. There is nothing out there that makes me go running to buy a pumpkin, disembowel and cook it. I however, really wanted to run out there and buy one. I wasn’t sure what I wanted to do with it, but I knew it had to be more than the fresh, cut out pumpkin vase for my fall centrepiece on my Thanksgiving table. So, with much enthusiasm I went to my local Isabelle Farm stand and picked out a small pie pumpkin. After a short photography session, the pumpkin was cut up, roasted and puréed. By now, I knew that I wanted to make this pumpkin tiramisu. I wanted something different, something creamy and not so heavy on the whole pumpkin pie spice thing. If you are looking for an easy, fairly quick and different dessert for your Thanksgiving table, then this is it. It’s creamy, it’s very subtle on the spice and even the pumpkin taste, it looks incredibly decadent and it’s very light and cloud like. I think you’ll like it. A featherlight, creamy Thanksgiving dessert made with pumpkin, mascarpone and lady fingers. Start by slicing the pumpkin in wedges and drizzle with a little oil. You can scoop out the seeds and reserve them to roast later. Let cool and scoop out from the rind. Puree the pumpkin in processor, use a ricer or just mash. You do need a smooth puree though. Let the puree chill before mixing in with the mascarpone and cream. This can be done a day or two ahead. Whip the heavy cream until soft but firm peaks form. Mix the mascarpone, pumpkin puree and vanilla extract together until well blended. Put aside while layering the lady fingers. In a 9 x 13 pan (23 x 33 cm), soak a lady finger biscuit in the syrup briefly, and place in the pan. Continue until one bottom layer is complete. Layer half of the pumpkin, mascarpone and cream mousse on top of the soaked lady fingers. Stack another layer of soaked lady fingers on top of the mousse. Spread the remaining pumpkin mousse on top of the second layer of lady fingers. Before serving you can dust with cocoa powder or chocolate shavings or even toasted pumpkin seeds. I forgot to do all of them! Make the ginger syrup by dissolving the sugar in the water on medium high heat. Add the spices and let simmer for about 15-20 minutes. The spices will have infused the syrup with their fragrance and flavour. I used a fresh pumpkin because I wanted a lighter pumpkin taste. You can probably use tinned puree but I recommend a fresh one if possible. I deliberately left off the usual heavy spices in the puree because I wanted a milder taste. The syrup adds enough mild spice flavour. My brother left yesterday back to Houston and I miss him already. We had a great time and just chatting with him made me feel at home. I love it in Colorado, and apart from England, I wouldn’t want to live anywhere else, but when family visits, you realise how much you miss them. I do miss my family in Houston and you don’t realise that until someone comes and visits and reminds you. At least I’m close enough to visit it if I get too family sick. On other news, my Saturdays are now mine again! My son finished up his fall soccer season and we’re relaxing until the spring season starts up. If you’ve been reading along for a while you will remember the tournament they played at the beginning of their season where they lost every game?! I have to tell you though, how magnificently they finished their season. They learnt to play as a team and became close team mates. They won 8 out of their 9 games (should’ve won that one too), a winning season! They played amazing games and were a joy to watch and for 8 year olds, they had me on the edge of my seat many a game. I will leave you with a photo of Laith and my brother at the last game of the season. Have a great week! Thanks Laura! It came out quite well and was well received by all. Hi Nazneen, this looks really good – I must admit I’m not actually a huge fan of tiramisu! I absolutely love coffee, but to be honest I really don’t think it belongs in food. Not a good mix in my opinion. An Italian colleague of mine at my old work used to make a really good strawberry tiramisu, though I’ve never seen it made with pumpkin before. Lovely colour as well! Dear Nazneen, I have never seen a Pumpkin Tiramisù before – it does looks incredibly elegant and light as a feather – yet decadent! What a wonderful idea for a seasonal dessert treat! I love that picture of the bright orange pumpkin so much and I really enjoyed reading your post too! How nice to come here and find “new ideas” and different kinds of recipes! – Thanks a ton for the mind-blowing, eye-popping pictures. This is such a great idea Naz! Like you, I can’t get enough of pumpkins when it’s in season, I am almost sad that I’m not in London this time of the year. Pumpkin tiramisu sounds like a gorgeous way to have even more pumpkin, AND enjoy the amazingness of tiramisu while feeling a little less guilty (I mean, theres veg in it right? 😉 ) Good one love! pumpkin tiramisu is probably the most creative and delicious dessert i have come across this season. This tiramisu looks so soft and moist, wish I had a piece here! What a great dessert Nazneen, and one that is adaptable in so many ways! What a gorgeous photo of your son and brother. My kids never played soccer but I can tell you that since my life has calmed down, I miss each and everyone of those crazy scheduled days! Abbe@This is How I Cook recently posted..Orange Bitters and Tequila Cranberries and a #Whole Foods $50 Gift Card #Giveaway! So its pumpkin month going on in your home. I loved all your pumpkin recipes but this one looks smashing! Choc Chip Uru recently posted..Candy & Our Winner! Wow, this is so creative! Really like the sound of this – truly inspired. Thanks. Nazneen, your son is a good looker. Hugs to the him for the lovely games he played and yay for relaxing weekend, I know how it feels. The tiramisu layers looks so good, very original. Lovely my dear. Your son is simply adorable, what a lovely boy, you must be so proud of him. Love the tirimisu, such an original take. Thanks H! He’s a cutie pie and my little man. With 3 girls, he is my little guy. 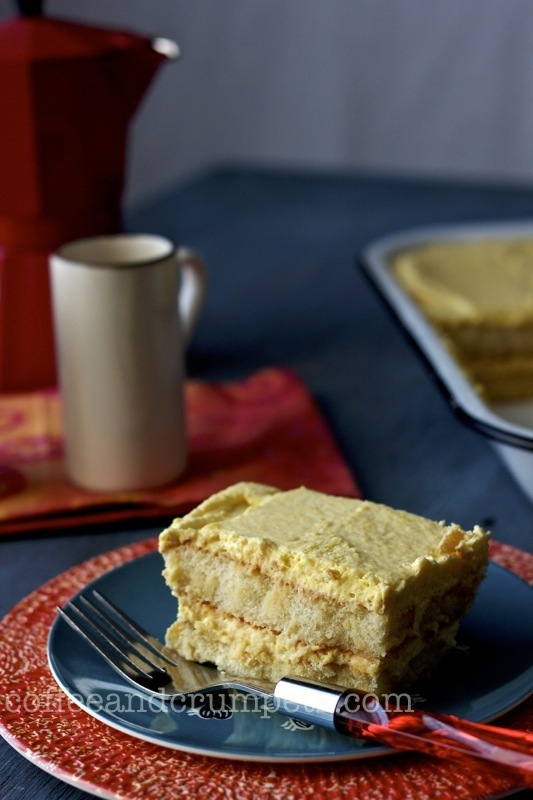 I had never thought of a pumpkin tiramisu – what great idea. I quickly got bored with regular tiramisu and have been making all variety of flavors – berry, almond, etc. – but this pumpkin version will be great for Thanksgiving! Thanks! I absolutely love tiramisu. I don’t make it very often so no chance of me getting bored with it, but I wanted to do something else with pumpkin for Thanksgiving. Thanks for stopping by David! Nazneen: I love how you styled the pumpkin!!!! This pumpkin-ginger tiramisu sounds marvelous. Of course, if I was there, you wouldn’t have had leftovers at all to show here. 🙂 The picture of your son and brother together is a real bonus. It’s great to see their happiness. Thanks Denise! It turned out well and I would happily share with you. What a coincidence! I made a tiramisu dessert today for a upcoming blog hop and when I got your notification I skipped the pumpkin and saw the tiramisu. And then I read pumpkin and I was shattered:-) But now that I am here I am happy with what you have done to the pumpkin…elevated it to a different level. With the ginger syrup, I can imagine the beautiful flavour of this Tiramisu. Lovely recipe Nazneen! Great sugar fiends think alike!! Can’t wait to see your creation Sonlai! I bet it’s a show stopper. Looks amazing, and paired with the ginger syrup, loving this creation, Nazneen. He was quite happy, but I think they need the time off now to relax a bit. It was hard work 2 practices a week plus the games. I’m quite sure you can’t get tinned pumpkin there, America is the king of all things tinned!